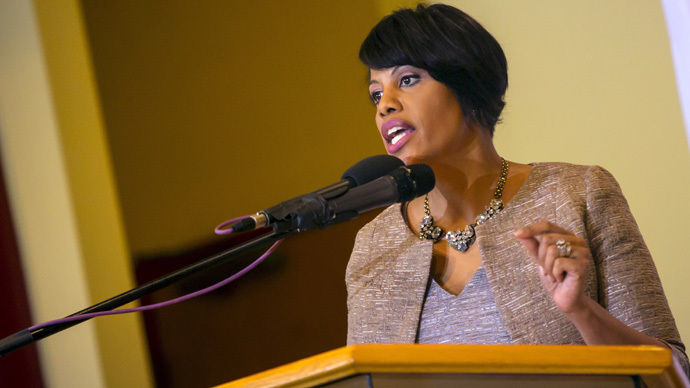 Baltimore Mayor Stephanie Rawlings-Blake has asked the Department of Justice to conduct an independent investigation of the city's police following the death of Freddie Gray in police custody that provoked more than a week of protests in the city. "Such an investigation is essential if we are going to rebuild trust in the community," she said. Rawlings-Blake also announced that the city's police would have body cameras by the end of the year, and that she hoped to update the officers’ bill of rights. Baltimore police came under heavy criticism last month after Gray died from injuries sustained during his arrest and the van ride to the booking center. Six officers are facing a myriad of charges related to his death. The DOJ is running a review of the Baltimore PD's use-of-force practices, which is expected in the coming weeks. "Throughout my administration, we have taken a number of steps to change the culture and practices of the Baltimore Police Department," Rawlings-Blake said, noting that complaints of police brutality have decreased during her tenure..
"Despite this progress, we all know that Baltimore continues to have a fractured relationship between the police and the community." The FBI and the Justice Department are conducting a probe into the death of Freddie Gray for potential civil rights violations. "I believe we need the assistance of the Department of Justice and civil rights investigation to shore up that foundation that is weak in our city,” Rawlings-Blake said during her presser. "We have to get it right. Failure is not an option." Marilyn Mosby, Maryland’s state prosecutor for the city of Baltimore, subsequently determined that arrest to be unlawful and charged six officers with various offenses related to Gray’s apprehension and death. Before she could announce the indictments, however, Baltimore had tragically been transformed after protests concerning Gray’s death turned violent. Demonstrations spawned fires and looting, and city officials say at least 200 businesses were lost during the riots. The National Guard was deployed and a city-wide curfew was enacted, but the city has since returned to relative calm upon Mosby’s decision on Friday to file charges against the officers. Rawlings-Blake’s announcement came one day after US Attorney General Loretta Lynch visited Baltimore, offering support to police, Gray’s family and the local community. Lynch also promised the Department of Justice would provide assistance in addressing “systemic issues” with the Baltimore PD. "We're going to try to come up with solutions, real solutions for the city of Baltimore to improve this city," Lynch said. "That is our goal. That is our commitment. It is my commitment on behalf of the Department of Justice." Baltimore officials had already requested DoJ help in October after a Baltimore Sun investigation found that the city had paid millions in settlements over the course of nearly four years for claims of police brutality and civil rights violations. "Such an investigation is essential if we are going to rebuild trust in the community," Rawlings-Blake said. "At the end of this process, I will hold those accountable, if change is not made." On Monday, Officer Edward Nero, 29, who is one of the six cops charged in Gray’s death, filed a motion requesting the Baltimore PD and Mosby produce the knife that Gray had on him. Police said it was a switchblade, which is illegal in Baltimore, but Mosby declared: “The knife was not a switchblade and is lawful under Maryland law.” Nero was charged with assault in the second degree ‒ intentional; assault in the second degree ‒ negligent; misconduct in office; and false imprisonment.